Are you looking for the Best Share Market Classes? Stock market trading is one of the most lucrative careers who look forward to and think about. Some of the best institutes in Pune teaching share trading are also serving a great platform for the beginners to earn and grow. The chances of failure in the stock market are high and very scaring. A professional training can help people trade with wisdom and skill. If you are looking to earn great wealth by making an investment in the stock market, knowledge of trading is a must. AryaaMoney offers real-time market learning in the real world share market set-up. Learners get intensive training from the industry experts with very deep insights of every aspect of stock and share the market with detailed training. All the programs are specifically designed to help students get the best results and achieve success in their career. Aryaa money also offers unmatched support and services for the learners. It’s the only training program which offers an all-around approach. The stock market is popularly known as a business of chance and luck which is not all true. With technical analysis skills, strategic trading and professional knowledge one can make huge wealth with stock market trading. One can make huge wealth with stock market trading. The main need is help and training from reliable share market coaching institutes. AryaaMoney Pvt Ltd is an Investment consultancy and Training Institute which is engaged in commodity, stock, forex market trading, training and consultancy services. It is ISO 9001:2015 Certified ISO 9001:2015 is a globally perceived standard for Quality Management Systems (QMS). Founded to transform common investor into an intelligent investor through valuable financial advisory services. The Founder of the company Bhuushan Godbole is a B.E ( PROD ) SEBI Registered, Investment Adviser INA000002405 CERTIFIED MARKET PROFESSIONAL and with the team of experts and professional experienced staff. AryaaMoney delivers the best Share and Stock Market training with all valuable inputs to grow a person in the trading industry. Shares swing up and down due to demand and supply hence huge money transactions takes place every day. That means lots of opportunities to make excellent profits get created. Intelligent trading is the only method to create and grow wealth from such opportunities. So we offer the best training programs to transform common investor into an intelligent investor professional trader`s workshop for stocks, commodity, forex. AryaaMoney not only trains students but also gives a real-world trading experience to the traders. We also offer free workshop and training facilities to masses from every domain who want to have a successful career and earn some huge income in the trading domain. 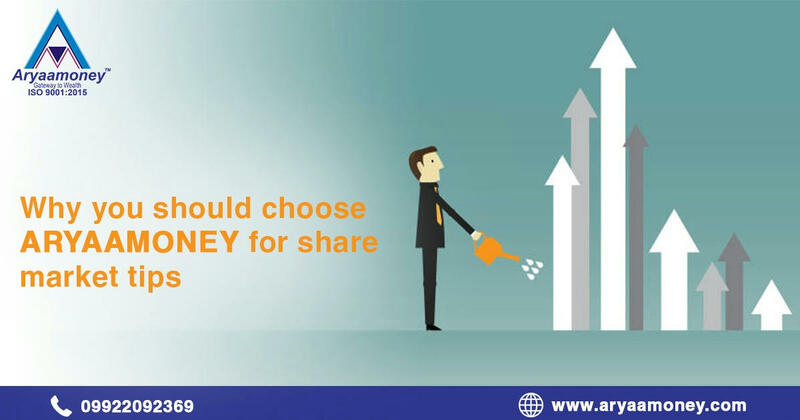 Join Aryaa Money and get the Best Share Market Tips and Stock Recommendations from experts in particular domains.